Soda sales are falling, so Coca-Cola is getting ready to sell us a new drink. You may have heard of it. It's called milk. It comes from cows. Coke's new milk isn't just plain old white stuff, though. Called FairLife, the new drink is marketed as "premium" milk with 50 percent more protein, 30 percent more calcium, half the sugar of typical milk -- and a higher price tag. “We’ll charge twice as much for it as the milk we're used to buying in a jug,” the president of Coca-Cola North America told analysts at a Morgan Stanley conference last week. “It's basically the premiumisation of milk," Coke's Sandy Douglas said, according to a transcript from the event. Douglas compared the milk to Coke's high-end juice brand, Simply. If the new milk does as well as Simply, in a few years it will "rain money," he said. So far, Fairlife is only sold in test markets. The soda giant plans to launch it nationally in the U.S. in 2015, according to a statement from a Coca-Cola spokeswoman. The enhanced milk is a joint venture between Coke and Select Milk Producers dairy co-op, a collective of large dairy producers. The dairy industry needs this to work. American milk consumption is declining, along with soft drink sales, as Americans increasingly swap cereal and milk for breakfast bars and fast food breakfast sandwiches. Retail sales of milk dropped 3 percent in 2014 after falling 2 percent the year before, according to data from Euromonitor. Competition from non-dairy milk alternatives, protein drinks and ready-to-drink teas may make it difficult for the milk industry to reverse the trend. Fairlife hits on a couple of food fads that may help it succeed. The drink offers more protein than traditional milk. And protein is having a moment, thanks largely to cross-fit enthusiasts and paleo dieters. Companies increasingly have been using claims of high protein to sell everything from jerky to cereal. People also seem to love milk alternatives and are often willing to pay a little bit more for them. Soy milk and almond milk revenues are expected to grow by 7.1 percent annually over the next four years, to $1.4 billion, according to data from IBISWorld, a research firm. Fairlife contains dairy, but the fact that “there is something special about the product” makes shoppers think of it a bit differently than “the basic private-label milk that people buy in supermarkets,” said John Sicher, the editor of Beverage Digest, an industry newsletter. Turning a staple drink into a premium beverage to justify a higher price isn't a new strategy. The alcohol industry does it with Grey Goose vodka, Patron tequila and Tanqueray gin. Water is probably the best example. Once just something that you got from the tap or even, gasp, a well in the ground, water was a more than $11 billion industry in 2011, according to the International Bottled Water Association. In addition to fancy water like Fiji and Voss, there are now sommeliers and websites dedicated to helping shoppers find the most luxurious types of water. Coke is in the water business as well with Dasani, which contains filtered tap water and trace amounts of minerals. For Coke, premium milk is part of a broader push to diversify as Americans tire of soda. Rival Pepsi, which owns Frito-Lay, has already done this. Coke's biggest competitor is pushing into dairy as well, with a yogurt brand sold in stores nationwide. Earlier this year, Coke capitalized on the rising popularity of energy drinks by buying a 17 percent stake in Monster. Coke also will offer its brands in Keurig’s single-serve cold brew machines next year. Honest Tea is the first Coke brand Keurig users will be able to brew in single-serve form. Injecting some new life into Coke’s business is paramount. The company reported a 14 percent drop in profit last quarter and announced a cost-cutting program aimed at reducing expenses by $3 billion a year by 2019. The soda giant also reported a 1 percent decline in carbonated drink volume in North America and it’s “very unlikely” it will see much growth in the U.S. soda business in the future, said Howard Telford, a beverage analyst at Euromonitor International, a market research firm. Shoppers, increasingly aware of high levels of sugar in soda, are opting for other drinks. 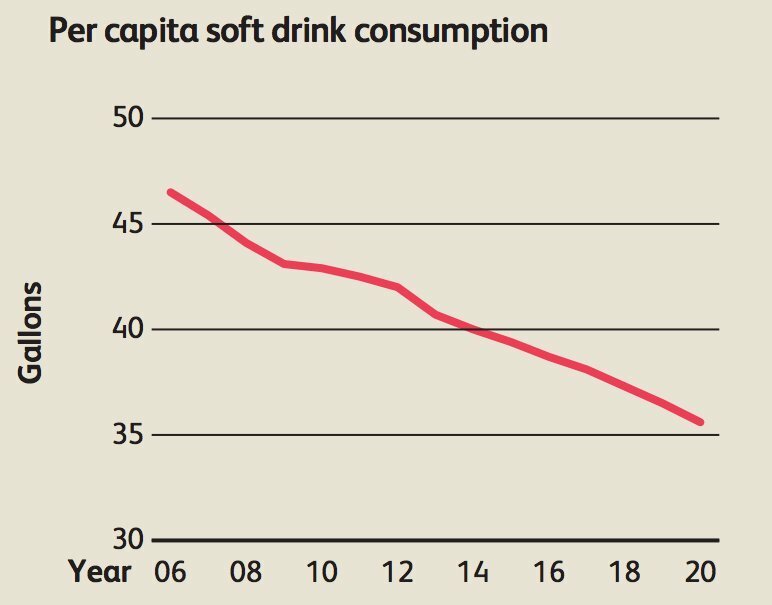 Americans will drink way less soda over the next several years, according to this chart from IBISWorld.